This looks like a canyon, but I'm pretty sure it's not Waimea Canyon. So let's just say it's some other canyon? 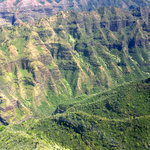 This is definitely Waimea Canyon! You can see the entrance straight ahead, I think. 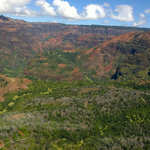 More of Waimea Canyon. It's so green! The beautiful Na Pali Coast, on the north coast of Kauai. 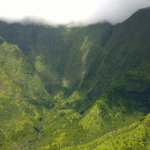 We flew straight in to this valley thing right near Kalalau Beach. It was intimidating. Flying out of the valley, the land drops away to the ocean very quickly. A great view of Kalalau Beach, which is the end of the Kalalau Trail that Jonathan and Sarah hiked. You can also see the reflection of my shorts! Stupid glare. 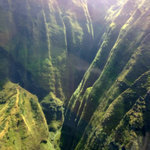 One last Na Pali Coast picture...from the air at least. There are more pictures coming from the sea - just you wait! Tunnels Reef is just off the coast, which is a great place to snorkel. More pretty mountains covered with trees and such. Us, happily back on solid land! 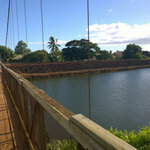 Later we drove over to Hanapepe for Art Night. 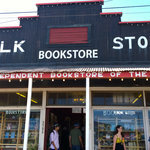 But first we went to the western-most bookstore in the United States! (I know the sign qualifies it with "independent", but the owner didn't) Sarah and David are excited to be there! 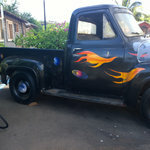 Apropos of nothing, this car's paint job (and matching gas pump!) 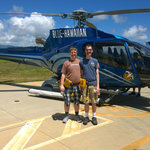 was pretty sweet. Me on the Hanapepe Swinging Bridge, which according to kauai.com is "one of Hanapepe's most popular attractions", which is probably technically true. Nice view, though! 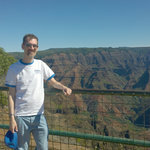 David at Waimea Canyon overlook. 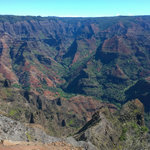 More Waimea Canyon, or "The Grand Canyon of the Pacific". So much green!